These images focus on the 27th floor outdoor terrace of a proposed 525,000 square foot office tower and emphasize the unobstructed, panoramic views of Washington D.C.'s monumental core. Design presentation and marketing renderings depicting buildout of a typical office floor and conversion of an existing terrace into an outdoor amenity space. Early design process imagery for what began as a 200' tower proposal at 437 W. 13th Street in NYC's Meatpacking District. The project was finally constructed at a more modest 10 stories. 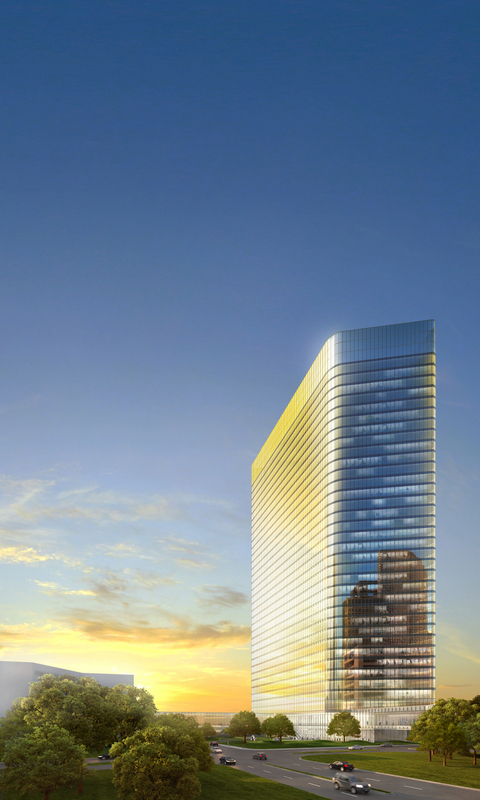 A multi-story dichroic glass art wall proposed for Devon Energy Corp.'s headquarters complex. Large format (~14,000 pixel) accurately scaled renderings showing facades and immediate context on either side of Park Avenue in midtown Manhattan. Produced for use in evaluating the visual impact of modifications to certain facades. Interior and exterior remodel of Brookfield Place's Liberty Street entrance showing retail and commercial tenant branding opportunities. Design presentation images for a two-floor, 22,000 square foot office build-out. Marketing images for The JBG Companies' 1.8 million square foot mixed-use development in Washington, D.C.'s NoMa neighborhood. Design presentation renderings depicting a proposed 40 story, million square foot office tower addition to the existing Allen Center complex.